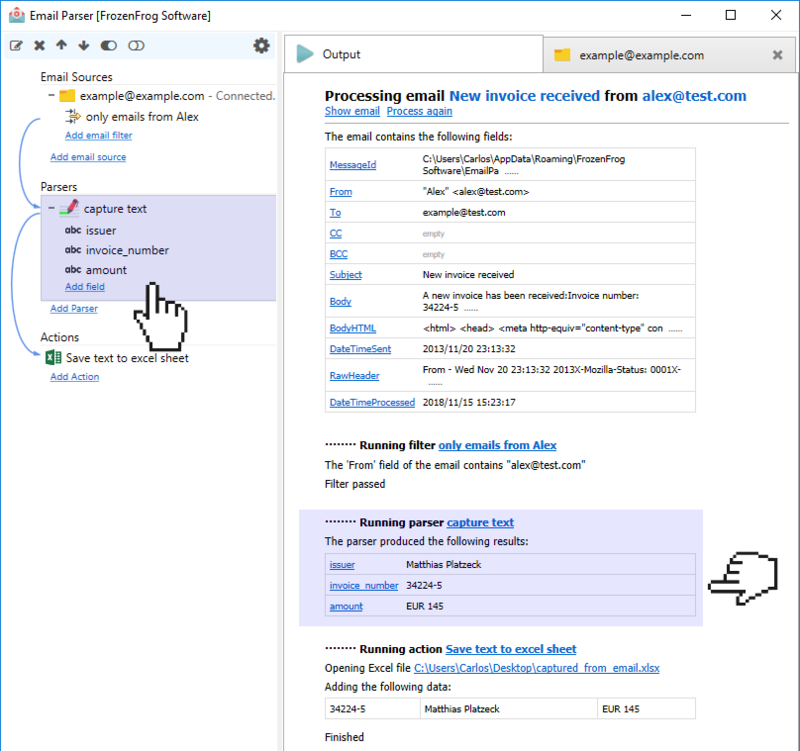 Email Parser uses different methods to find the text string in the email. Depending on your skills or the complexity of the email text you will use one or another. You can even combine them for the most complex cases. Starts with… continues until… Used for the most simple parsing tasks. It allows to extract text based on where it starts and where it ends. Regular expression match Uses the powerful regular expressions to define the format of the captured text. Text filtering and replacing This method is used to remove or replace characters, usually in combination of other text capture method. Capture HTML tag Capture HTML tags meeting a set of conditions like the style, its class etc. Read attachment contents Not strictly a parsing method. It is a tool used to read the contents of the attached files and make the content available for parsing using another methods. Script-based parser The most powerful and flexible way to parse an incoming email. Suitable for those users who have very specific needs. They are not meant for the average user as it requires some programming skills.